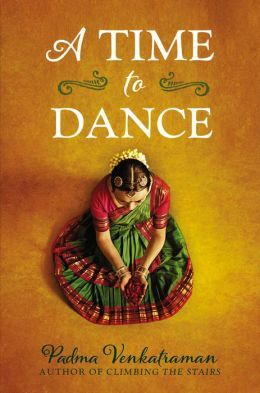 I reviewed A Time to Dance by Padma Venkatraman, when it was first released in 2014 by Nancy Paulsen Books. It is a beautiful story written in free verse. The author has sent me an autographed paperback copy (2015) to give away to one lucky reader. All you need to do is leave a comment below indicate your interest, follow my website, and be a resident of the US or Canada. I will announce the winner on September 13. I have included part of my earlier review of this remarkable gem. The hardback copy is a permanent resident on my bookshelf. Book Jacket Synopsis: Veda, a classical dance prodigy in India, lives and breathes dance–so when an accident leaves her a below-knee amputee, her dreams are shattered. For a girl who’s grown up used to receiving applause for her dance prowess and flexibility, adjusting to a prosthetic leg is painful and humbling. But Veda refuses to let her disability rob her of her dreams, and she starts all over again, taking beginner classes with the youngest dancers. Then Veda meets Govinda, a young man who approaches dance as a spiritual pursuit. As their relationship deepens, Veda reconnects with the world around her, and begins to discover who she is and what dance truly means to her. Reading Venkatraman’s novel is an experience of India in all its beauty, cultural traditions, senses and sounds. If you listen closely you can hear the faint echo of a dancing rhythm. Thaiya thai. Thaiya thai. I highly recommend this beautiful novel for tweens and teens who have faced challenges in their lives. This book is a treasure! Padma Venkatraman is a chief scientist and oceanographer by training and a writer by choice. She is the author of Climbing the Stairs and Island’s End, both multi-award winners. Padma was born in India, but is now an American citizen. Visit Padma at her website. It has discussion questions and teaching resources. Synopsis: A storm sweeps through a village and a fisherman and his two children, Hansel and Gretel, are the only survivors. Their food runs out and Hansel and Gretel are sent to search for food in the forest. Their mother protests that Hansel is sick and too young for such an adventure. But, Hansel’s father disagrees and says he has Down syndrome and that they can’t always protect him forever. Hansel takes the lead and bravely runs into the forest and stumbles upon the witch’s candy house. Will Hansel be able to outwit and negotiate with the witch? 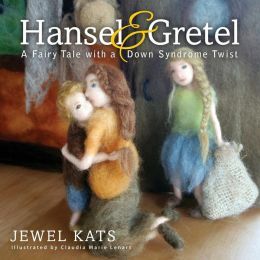 Jewel Kats retells this magical story with the main character, Hansel, who has Down syndrome — a different ability. It is the perfect read for World Down Syndrome Day, March 21. This book will help readers look beyond disabilities and see Hansel as a clever, capable, determined and successful hero, who faces the witch with wit and kindness. 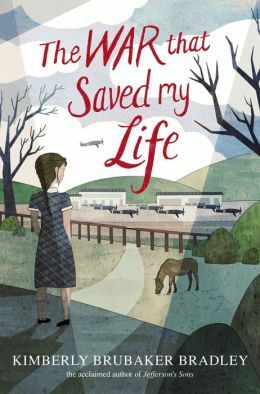 The story breaks stereotypes and touches on prejudices about what a child with a disability can achieve. And there is an unexpected twist with the witch, who also shouldn’t be judged by her appearance. Claudia Lenart’s illustrations are breathtaking, whimsical, and contribute to the book’s appeal. Lenart is a fiber artist who pokes wool and other natural fibers, like alpaca, with a barbed needle to sculpt her soft characters and scenes. This is the perfect medium for a fairy tale. Resources: Check out the website for World Down Syndrome Day, where you can find information, personal stories, worldwide events and how to participate. And visit Jewel Kats and Claudia Marie Lenart at their websites. Synopsis: Muthini and his grandmother, Nyanya, live in rural Kenya near the mountains. Nyanya barely makes enough money to support nine orphaned grandchildren. Muthini, whose name means “suffering” is the youngest and was born with no fingers on his left hand and only two on his right. He is teased by others. When he asks his grandmother why he as fewer fingers she tells him “we are each given more of some things and less of others.” ” It is so sad that other children only have ten fingers when you have a larger heart, a bigger brain, and greater spirit.” One day his grandmother realizes that she is too old to help Muthini. She takes him to a special residential home/school for children without families, where he meets the director. Gabriel, looks at Muthini’s hands and only sees his potential. But Gabriel will only accept Muthini if he changes his name to Baraka, which means blessing. 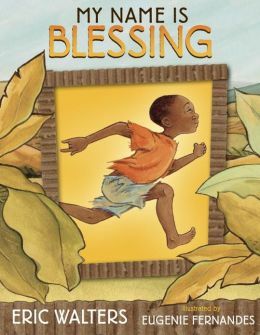 Why I like this book: Eric Walters’ story is about a real boy named Baraka and his grandmother, Grace. His text is very lyrical and heartwarming. His extraordinary story begins by showing Muthini’s disability as a misfortune. But Gabriel focuses on Baraka and his great heart and spirit. Baraka is a blessing and not one who suffers. Eugenie Fernandes’ acrylic illustrations are done in soft browns and yellows hues and capture both the emotion and spirit of the story. He gives great detail to facial expressions. Resources: There are five pages of back matter about Baraka and his grandmother. Walters shares information about the Mbooni Region of Kenya — the poverty, famine and disease which leaves 500 children orphaned. He chronicles his 2007 visit with photographs of Grace and her family, their meager living conditions and the region. Walters response to what he sees by founding The Creation of Hope, a residential care center for children. You can read about Eric Walter’s work in the book and on his website. Make sure you check out the page devoted to the Creation of Hope. Synopsis: Malik is up early and perched in his wheelchair on the rooftop. He is ready to launch his home-made kite, Falcon, into the skies. He sends his brother to the streets to catch the kites he hopes to set free today. His sister helps him launch his kite. Falcon is small, but built for speed. Malik works his string so that Falcon dives and breaks the strings on the kites of the next door bully. He moves on to circle other kites plucking them from the sky. His brother returns with a pile of kites. By the end of the day Malik has succeeded in showing that he is the best kite fighter and flyer — the King of Basant. As Malik watches the bully shove a girl to the ground and grab her kite, this king shows his kindness to the girl in a special way. Why I like this book: Master storyteller Rukhsana Khan has written a celebratory story about a boy who is clearly more focused on his abilities than his confinement to a wheelchair. Choosing a child with physical challenges will inspire other children. Malik has talent, technique, self-confidence, and determination. He wants to win the annual kite battle in Lahore. And, Malik beats his bully neighbor with his kite-flying skills and not hurtful words. Khan has turned this centuries-old tradition into a contemporary story for children. Christiane Kromer’s illustrations are exquisite and there is a feast of color on every page. She focuses on so much detail that you can feel the breeze of the soaring kites on this perfect day. Her pen and ink illustrations are a mixed collage of beautiful fabrics, laces, cut paper and folk art designs of Pakistan. 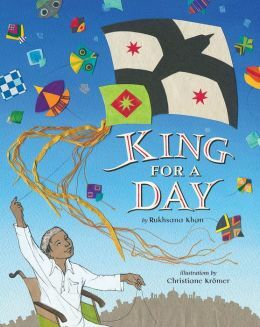 King For A Day is a beautiful collaborative effort between author and illustrator. Visit Rukhsana Khan and Christiane Kromer at their websites. Resources: Khan has devoted a page at the end of the book to the Basant Festival, which is celebrated across South Asia to herald in the spring. Making a kite would be a fun activity for kids. Watch this Kidspot Youtube video and learn how to make your own home-made kite. With markers you can write fun or inspirational messages or write you name on your kite if it blows away. Special Note: Monday, January 27, I am joining other bloggers in celebrating Multicultural Children’s Book Day, which celebrates diversity in children’s literature. The event is co-hosted by Mia Wenjen from Pragmatic Mom and Valarie Budayr from Jump Into a Book/Audrey Press. Please visit the website to view multicultural books in all genres.